With cares looming after a long week, relax and unwind at The New Stone Mill Spa located in the beautifully restored Stone Mill Inn in the heart of Niagara. 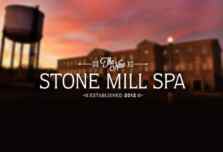 The New Stone Mill Spa is holistic in its approach to healing and creates a calming comfortable atmosphere conducive to ones overall well being. Select any one of our luxurious signature spa treatments to help melt your stress away. Whether visiting from a far or taking advantage of a fleeting moment away from your day to day obligations, The New Stone Mill Spa is sure to provide that tranquil environment and escape you desire. Susan and Louise O’Sullivan of SOS IMAGE Inc. are an ambitious mother and daughter duo who have adopted the formerly known Stone Mill Spa and have transformed it into the one of a kind spa experience available to you today. Their goal is to provide a completely unique and truly special spa experience to visitors and locals alike. With Susan’s experience in the beauty and aesthetics industry including her growing mobile beauty business providing services to brides across Southern Ontario; in combination with Louise’s extensive experience as a business owner and an administrative guru, their entrepreneurial vision is positioned for success.